Well, tonight I will be having the Rambling Amblers and Paddlers over for pie and tea and I set up the camera and made sure I had a charged battery, and everything was in working order. I snapped a photo to check how it looked. and then I thought, "nice." 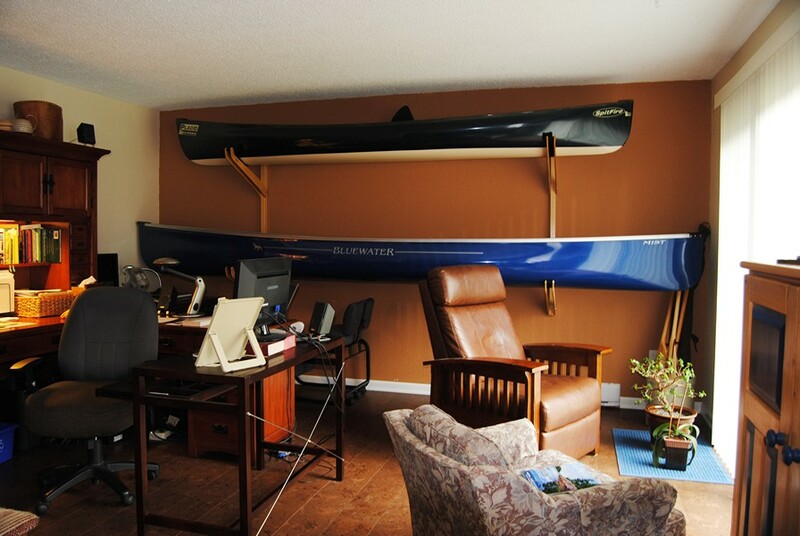 I like my wall full of canoes. I sit there at my desk most days, working away, and feel very blessed to have such a beautiful room to work in, and to listen to the silence of those two canoes. Well, they are mostly silent. They do whisper sometimes, and no it is not my tinnitus. It is that communication we receive from objects that we have spent time with, doing good things. I suppose it is some kind of neural manifestation of an unconscious desire, or something. It is like a little voice, in the back of your head saying, "lets go paddling." Such a good idea, but I have other things to do right now. "Soon. Very soon." I reassure the boats. Well, I reassure myself. Indeed, Richard, there is a "whisper". I keep my Atlantis Spartan V1 inside, where I can see it from my study. We have some wonderful "conversations" - some are simply comforting...others lead us to the sea. :) Lovely post. Duncan. Very nice. The only problem is that I'm pretty sure I would smash a monitor or two getting my boats in and out of a room like that. Duncan, glad to hear it is not just me! Sounds like you are better at following the still small voice than I am. Bryan, I hear you re the electronics. I do actually clear off the desktops when going in and out with the boats. So far I have only banged the walls a bit, but it helps to have light boats. Richard that room is a heart breaker and as much as I love the canoe wall what warmed my heart was the two cosy chairs facing the window. Not to miss mentioning another beautifully composed photograph. Thanks John, yes, it is a cozy spot to sit with the morning sun streaming in. Bella. Hi Richard, Once more with feeling. I was at Michel & Blanche Gauthier's (author of the Sayward Lakes and Nation Lakes canoe route guides) for dinner with a couple of canoers and a kayaker and the dinner conversation touched on the affection canoe people feel for their boats. Not only affection but a relationship somewhat akin to an equestrian and favourite horse with terms of endearment and even a subtle communication, our kayaking friend said that there is no such connection between a kayaker and their craft in his experience, at least he doesn't feel it and has never in his long history heard anyone refer to their boats the way we do. Not better or worse but certainly different. John, that is so interesting. I think your phrase "canoe people" is the key. I would hazard a guess that those who see canoes as means to some other end (i.e. anglers) would have less resonance with their craft, but those of us who really get into the experience of paddling, and who spend lots of time picking out, customizing,maintaining, and maybe even naming our boat are like those people who own a horse. I have been known to talk to my canoes, I have to confess, and they are really good listeners! There is one message my long, narrow Wenonah Voyageur gives me. I hear this message every time someone compliments what a fast looking canoe it is. If I listen closely, I can hear the lithe craft grumble, "Well, I could be a fast canoe, if I didn't have to make do with this ancient, 1945 model propulsion unit...."
Paul, if only our canoes gained 1 horsepower when we treated them like a horse! I know, there are limits to anthropomorphism. But by the way, your 1945 model propulsion unit still outperforms my 1961 unit, so your Voyageur is probably really glad you own it and not me. What a great way to store ones boats! I feel some envy. My boats are 10 minutes away from my home (by bicycle). They are stored in a boathouse close to the river. But I am sure they do not only whisper - they call out loud. That must be why I visit them from time to time and put them on the water - even now in winter. This measure calms them down - and me too. Hey PADDELBLOG, glad to hear you are getting out on the water. With my current schedule it is going to be mid March before I can paddle again, but that is coming quick I guess! Was just on your site and saw your book. Wow, it looks great. I love the photos on the front, all of them have their own "call" to me! Beautiful Keewaydin! I hadn't seen that boat on your blog before, is it yours? Unfortunately the Keewaydin is not my boat (as tandemboats I use a Souris River Prospector or an old MadRiver Sundance). If you look into my blog (http://paddelblog.blogspot.de/) again today you will find a longer report on a winter-paddletrip we took this sunday (with lots of pictures in it). We were ten paddlers and as much as four of us capsized on this tiny creek. But due to the fact that each and everyone was wearing a drysuit these capsizes weren't serious affairs.